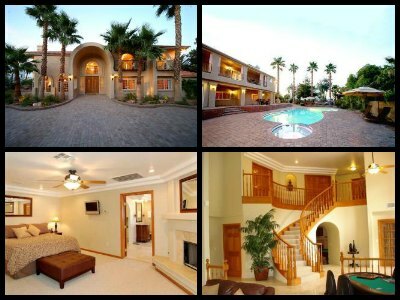 Rent one of the luxury homes in Las Vegas for the ultimate vacation! No hotel can compare in style, intimacy and beauty of some of these high-end furnished vacation houses located near the Strip. What if you want to have a family reunion, a large party or a corporate event, or just want a quiet retreat from the crazy Las Vegas Strip during day hours? There's no place for that like Las Vegas, and these beautiful homes are ready to make your dream vacation come true! 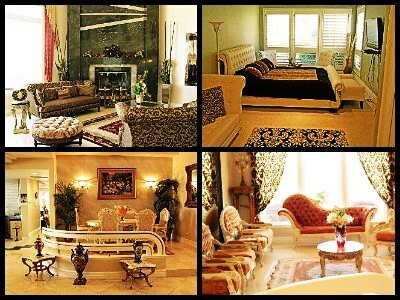 I've selected 10 most stylish, beautifully furnished luxury vacation homes in Las Vegas, most of them by owner. They are perfect for corporate, family or wedding vacations. Review: Spanish Mansion is, perhaps, the most raved about property among all luxury homes in Las Vegas for rent. This modern, renovated vacation house boasts 11 spacious bedrooms, great pool with water slides and a diving board, a private 2,5 acres golf course with four holes, hot tub and bbq area. The mansion consists of 2 connected properties, and therefore offers 2 fully equipped kitchens and 2 spacious family rooms. Furniture in the house is new and modern, flat screen TV's in each of the 11 bedrooms. Spanish Mansion is perfectly tucked away from the Strip so you can have your privacy, but only a few minutes' ride by taxi or limo if you plan to go to the Strip a lot. The large shopping area Town Square is within walking distance so you can easily buy food and all the necessities, or spend time with style at bars and restaurants. Review: This stylish luxury home in Las Vegas is located close to the historic district John S. Park. This property is able to accommodate large groups of up to 32 people and is great for kids and adults a like and offers of plenty of things to do. 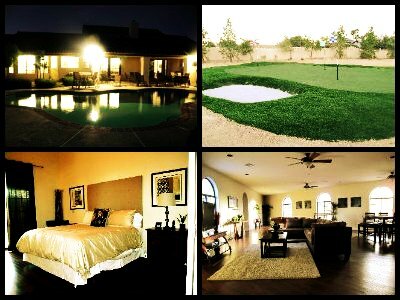 The ranch boasts incredible views of Las Vegas skyline and the mountains. This property boasts many great reviews. The main home offers 8 bedrooms, with 2 bedrooms located in a small Casita located nearby. The Casita is available for rent separately. The main attractions of this luxurious home are: a pool table and a poker table in the game room, a swimming pool and a hot tub, and an area for kids with a treehouse and trampoline. Many reviewers commented on great service and resourcefulness of the owner of this vacation house. Review: La Rosa Fun House is a beautiful luxury home in Las Vegas, offered by the same owner as The Unbelievable Vegas Ranch reviewed above and The Jamaican Estate below, and deserved multiple great reviews. La Rosa Fun House is located pretty close to the Strip, which comes with incredible views of the Strip from the master bedroom. And the proximity of the Strip will make your night escapades easy and fun. Review: The Jamaican Luxury Estate is a gorgeous luxury home in Las Vegas that definitely reminds of a Caribbean villa on a beautiful tropical island. This rental property is located very close to the Strip, yet it's so quiet and secluded, with only the Vegas skyline reminding you that you are in the most gorgeous city on Earth! The Jamaican Luxury Estate is offered by the same owner/manager as La Rosa Fun House and Unbelievable Ranch, and boasts many reviews by happy customers. The villa has a beautiful patio/pool area with an island-style pool, Jacuzzi, pool table, luxurious showers and a BBQ area. Review: Players Compound, located in the prestigious planned community The Lakes, not far from the Spring Mountains, is a gamer's dream come true! 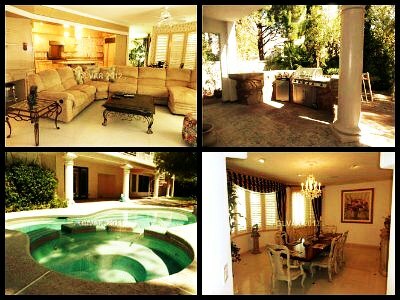 this mansion is perfect for family vacation and large private parties. The owners are willing to accommodate more people with prior notice. One of truly luxury homes in Las Vegas, Players Compound boasts 4 levels with 10 bedrooms, over 30 TV's and plenty of entertainment areas. A multi-purpose game room on Level 2 boasts a poker table, a craps table and stage for DJ. Entertainment area on Level 4 offers a wet bar, 6 HD TV's, a poker table. In the back yard, you will find a relaxing pool, a spa, private golf court with 8 holes and something unique to this mansion - a basketball court! This tastefully decorated villa is a vacation paradise! Although it's conveniently located not far from the Strip, you won't want to leave this place with its beautiful skyline views, cozy fireplace, and a media room/home theater. The Vacation Kingdom offers everything you look for in luxury homes in Las Vegas for rent: elegant furnishing, multiple amenities, and lots of entertainment options. There are large TVs, pool table, poker table, a bar, pool and a hot tub. And your kids won't want to leave the Movie Theater room. Review: A golfer's dream house, this luxury home in Las Vegas is located on Rio Secco Golf Club - one of top 10 golf courses in Nevada. Hidden away from curious eyes, surrounded by lush greenery and protected by gates, this luxurious European-style vacation house offers a perfect urban retreat and quietude. The Strip is within 15 minutes' drive from the house. The luxury house offers 4 large bedrooms, a family room overlooking a large swimming pool, a dining room and a theater room with theater seats. There are marble and stone fireplaces in the house, a swim-up bar and bbq at the pool area, a large bathroom at the master bedroom and a large garage for 6 cars. Review: Beautifully appointed with decorative ornamentation reminding of the luxurious Waldorf Astoria hotel, classic artwork, chandeliers and classic furniture, Spanish Hills Villa offers true luxury and a quiet atmosphere. Located in Summerlin, this luxury home in Las Vegas is located within a short 10 minutes' drive from the Strip and within a stone's throw from the Red Rock Canyon and is surrounded by multiple golf courses, all within a few minutes' drive. The luxurious rental property offers 5-star amenities, marble floors, 5 bedrooms, 5 bathrooms, a game room with a pool table, spacious swimming pool and fully-stocked wet bar. Review: This luxury home in Las Vegas offers a perfect getaway with its 5-star amenities, concierge and butler services. The Quail Estate is located 5 miles from the Strip in Paradise area, and is surrounded by luscious green landscape. Quail Estate boasts 5 large bedrooms, dining room, family room, flat screen TVs in every room, a game room stocked with X Box 360 games, gym with treadmill and a set of weights, and a large movies library. Outside, there is a huge patio, bbq, swimming pool and even a spa. Review: Located in an affluent neighborhood Spring Valley, right next to the Spanish Trail Golf and Country Club, Elegance Estate is a one of the top luxury homes in Las Vegas for rent. 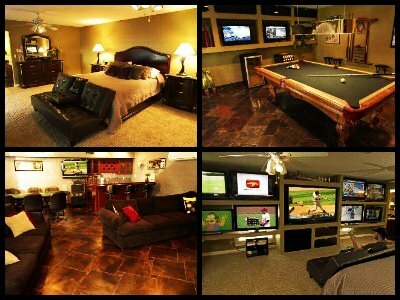 The mansion offers luxurious amenities - 4 bedrooms, steam showers, hot tubs, a game room, a bar, and a library. There's plenty to do outside and within the community area, without having to go to the Strip. On the backyard, you will find a large swimming pool, waterfalls, spa and a bbq area. If you want to go to the Strip, it's located just 15 minutes' drive away.